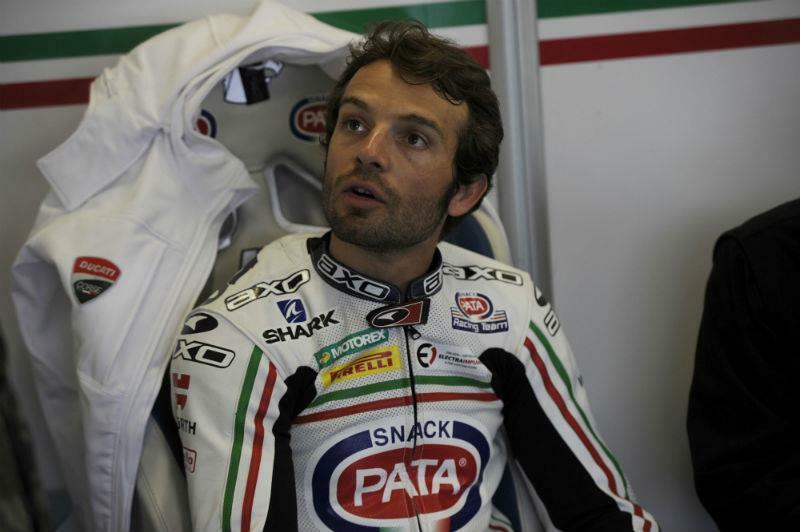 Pata Ducati rider Sylvain Guintoli won the second World Superbike race at Silverstone today in torrential conditions which saw the race stopped and a result taken after nine laps, with half points awarded. The riders took to the grid on slick tyres, but the start was delayed as rain started to fall and the riders changed to wet tyres. Brit Tom Sykes opted for an intermediate tyre, but pulled in after the warm up lap to change to a full wet. As a result Sykes had to start the race from pit lane. Guintoli was the fastest rider off the line, leading by several seconds after only the first lap, but Jakub Smrz also got a good start and wasn't letting his former team-mate pull away. Race one winner Loris Baz got faster as the race went on, moving passed Smrz and into second on lap seven. Two laps later Baz moved in to the lead but crashed seconds later. The race was red flagged almost immediately after Tom Sykes also crashed. Other riders who crashed were Carlos Checa, Davide Giugliano, Maxime Berger and Jonathan Rea. Baz and Smrz finished second and third respectively as the results were taken from the end of the prevous lap. Brit Leon Camier's bad weekend continued after a mechanical fault forced him to retire. Aprilia rider Eugene Laverty thought he had finished in the top three but finished fourth.